Because of the new “feature”, the addon has been receiving lots of bad reviews, so today, I decided to check in to see how things were going on that front. I grabbed my cup of coffee, opened the page, and was astounded to see 5 star reviews. Not tons and tons of them, just enough to drop bad reviews off the front page. All the positive reviews didn’t mention anything specific, just stuff like, “GOOD PRODUCT” “HELPED ME GROW MY BUSINESS” and so forth. Yeah, this looks legit. 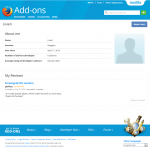 The location field at addons.mozilla.org is a text field, so everyone using the exact same string for their location raised a red flag. Another was the fact that they were all made on the same day. At this point, I decided it was time to poke the moderators and see what options were available. It’s okay to ask for donations. It’s okay to inject ads, as long as you’re up-front and honest about it, and the option to turn them off is there. However, it is NOT okay to falsify reviews and hide negative feedback through the use of deceptive practices. This shows a level of intellectual dishonesty that disrupts trust between you and your users. From this point forward, as the addon in question is available under the MPL licensing agreement, I will be uploading the disassembled addon to GitHub. Anyone is welcome to fork, make PRs, and maintain the addon. It’s clear that the project can no longer be trusted with Mr. Popov, but I do not have time to maintain it long-term, due to existing duties, and I am inexperienced with Firefox addons. The binary is available in my previous post. I do not have time to go through the review and signing process for AMO at present, so it will be self-hosted, for now. Development, Personal amo, deception, firefox, screengrab. permalink.